The Populist Bebek and The Beer Dream Machine Istanbul. Lagranja Design was commissioned to design the second ¨The Populist¨ restaurant, located in Bebek, a sophisticated neighborhood of Istanbul. When Lagranja design studio in Barcelona undertook the ambitious project of Istanbul, the challenge consisted in the conversion of Turkey’s first beer company into a modern brewery with an industrial overall look, inspired by the graphic language of the Prohibition period, the result was ¨The Populist¨, located in the Bomonti area, restaurant acclaimed as the best place to be in Istanbul. Lagranja Design now completed the second restaurant for the same brand. This time, the project of the second ¨The Populist¨ had some distinct spatial characteristics that demanded new ideas and solutions, therefore it could not just adapt to the design. The new ¨The Populist¨ is located in the former space of a garden villa, in Bebek, a wealthy neighborhood on the Bosphorus strait. 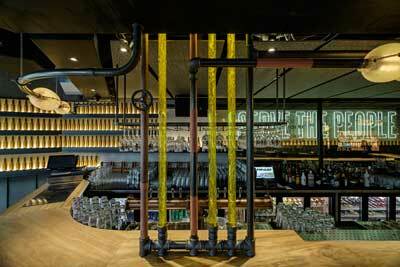 For the first Populist, the studio aimed for an industrial atmosphere with exposed beer tanks. For ¨The Populist Bebek¨, in order to fit the neighborhood´s characteristics, a more refined and dreamy look has been created. Taking into consideration that the beer served in the restaurant is made in the first Populist, the design team was inspired to come up with a key element in the design: ̈The Beer Dream Machine ̈. The installation represents a ceiling mounted sculptural piece that serves as lighting and simulates the circuit of the beer fabrication. This piece also implied the architectural intervention over the two floors of the brewery, as the second one was transformed into a balcony overlooking the main level. This detail managed to direct the complete attention to the machine, as it can be easily noticed from every corner of the establishment. Therefore, the sculpture eventually becomes a complex machine and it almost feels alive, as the liquid is constantly flowing through the pipes and the lights are changing all through the day to create different atmospheres. At late hours they are dancing following the rhythm of the music playing in the brewery. ̈The Beer Dream Machine ̈is not the only bespoke furniture created for the The Populist¨. Therefore, another distinctive design is the stool called Bebek¨, which is described as ̈very expressive ̈ by Gabriele Schiavon, designer and co-founder of Lagranja Design. The design, as Gabriele Schiavon explains is thought to be seen from behind, as the stools are always placed facing the bar, so this is why the emphasis is on the backrest¨. The stool will be included in Lagranja Collection, a brand that brings together collections and pieces of furniture designed and edited by Lagranja Design. The neon texts aim to recall the disobedient atmosphere created by the crowds against political issues during the Prohibition times. Protest is reflected in a tangible yet fun aesthetic, using powerful slogans related to food and beverage. The bold messages evoke the indignation, force and determination of the people to satisfy their needs. Nevertheless, the text is not meant to be taken literally, so the twist consists in treating it with irony and humor, with messages such as ¨Hands of my glass¨, ¨Fight for your fries¨, ¨Burger is the answer¨. The white light was chosen for the neon to make the text noticeable, without overwhelming, so the emphasis is kept on the overall space. Therefore, the slogans almost act like paintings that add dynamism to the design and make the user feel comfortable by stepping in a friendly environment. The bar counter is thought as a single geometry that integrates many elements: the countertop, LED lights, hangers and the footrest. The chosen finish evokes the texture of the beer tanks and emphasize the overall industrial look of the space. Each seat has an allocated hanger with a sphere following the same color scheme as the upholstery of the stools. The common additional tube used as footrest becomes unnecessary, as this function is fully integrated in the sinuous curvature created. Originally, the space consisted in two floors linked by a staircase. The decision of opening the middle part of the upper floor was made in order to obtain a homogeneous space and visually connect the two levels. Consequently, vertical intervention ensures the best scenario for the Beer Dream Machin to be seen from every corner of the restaurant. The black mesh handrail is chosen due to its transparency, so the space can be observed without any visual noise. The strength and firmness of the handrail inspired the idea of converting round serving trays into tables. The bathroom might be seen as the synthesis of the entire project. Representative pieces of bespoke furniture used in the restaurant can be found in this space. For instance, the sink is made out of pieces of rehabilitated copper tanks used to store the beer. White neon lights are used as direction signage and a fun neon message is included in each bathroom. By placing a tinted glass on top of the text, the light behind makes the surface become a mirror. The general illumination is assured by duct and luminaire segments used for the Beer Dream Machine too. 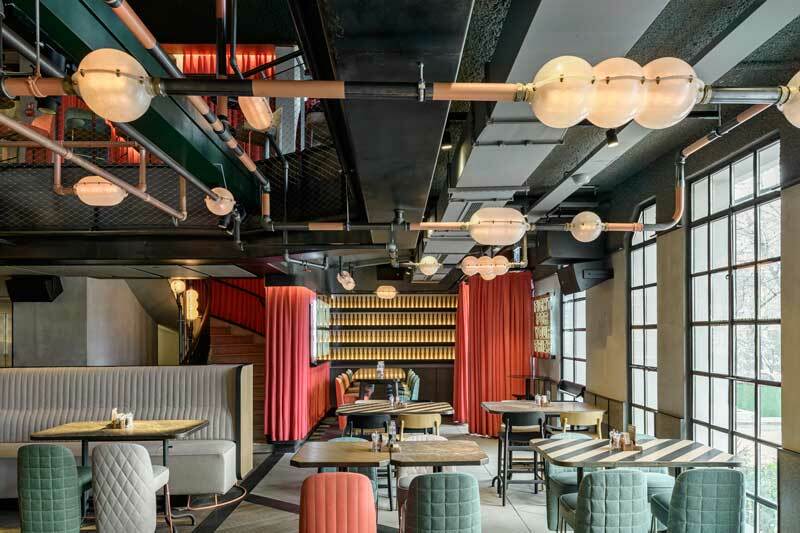 The industrial look is completed by the sink faucets, which are made out of the same type of copper pipes composing the beer installation and the lighting fixtures. 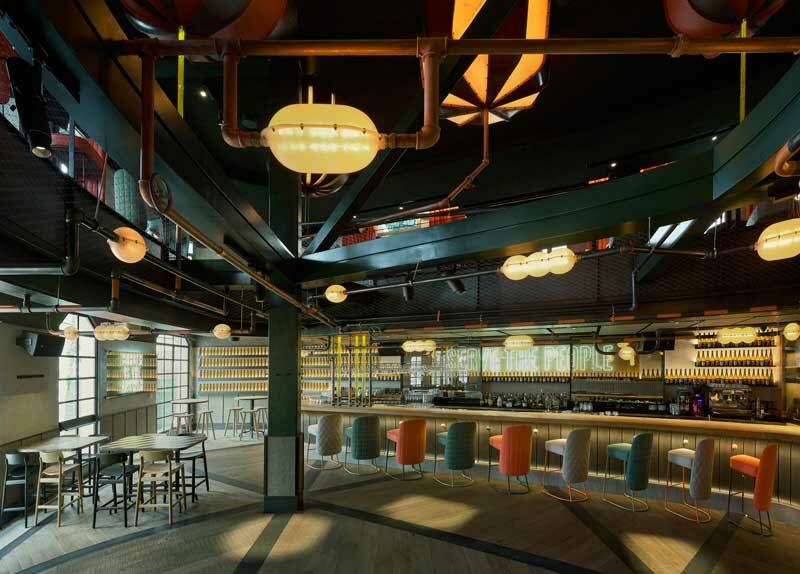 The aim was to create a unitary design that tells the story of beer’s true spirit and the prohibition, outlining in the same time the historical value of the location it occupies. THE OTHER ROOM by Lagranja Design Studio. Tommaso Guerra designed Stilelibero Restaurant in Rome.